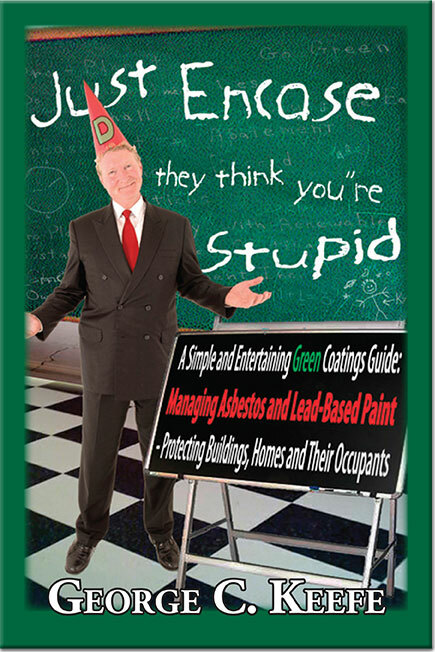 Just Encase They Think You’re Stupid is a fictional easy read on the real time hot environmental topic of green coatings solutions. It answers how and why potentially hazardous materials such as Asbestos, Lead Based Painted surfaces and other questionable building stock can benefit from the use of high performance, low VOC green coatings. The credible characters in this book explain the historic and present uses of the hazardous materials and discuss the complications associated with their removal. Common misconceptions are corrected revealing a simple method that can safely and cost effectively manage them in-place. Studies show that 42% of the CO2 emissions causing green house gases are coming from landfills filled with unwanted waste, much of it from roof tear offs. Simply said, green coatings can be used to recycle and renovate existing buildings and roofs, extending their life cycle and avoiding expensive demolition, tear offs, transportation and disposal. I am writing this note to thank Global Encasement Inc. (GEI) and specifically George C. Keefe for helping us find a solution for a potentially very large challenge we encountered during a complete renovation project of a 1960 steel building for Portland State University in Portland Oregon, The challenge was to find a solution that would allow us to do a complete renovation of a building that has asbestos fire proofing throughout in a safe and be economically method. George listened to our concerns and found us several case studies of other projects that dealt with the same type of issues. With his guidance we came to the correct decision that "AsbestoSafe" was the safest and by far the most economically friendly solution for our project. Using the “GEI Encasement" system it allowed us to have our abatement contractor install the product throughout the building and give us a safe and durable coating for other to work in a safe and carefree environment as well as leave the building in safe condition for the future. As for the economically side to use of this product, the cost to buy and install was 1/lOth of the cost to remove all the asbestos fire proofing and then re install. This was the perfect solution to our problem. Thanks again for the help and advice finding the right method. JUST ENCASE…… is one of the most informative and educational books I have read. It is certainly one of the few that I have read a second time. I feel that the double meaning of “Encase” is a clever one. The author has done a good deal of research and skilfully combined his findings with his own experience. Rather than frightens, the book enlightens one to the dangers and advantages of the use of Asbestos. It echoes the message in Silent Spring.. I met the author and was impressed with his style of humour which he incorporates well into the body of the novel. It would be folly to ignore the message that the author of “Just Encase They Think You’re Stupid” presents in clear and easy to read style. I Read the book and refer to it at times it is very informative and well written I should advertise it more and I will. Very informative book! I’m not an expert on green products but this book really made me to think /realize how important that green products are to SAVE the world including humans of course. It is easy to read for everyone. I would like to thank to the Author, Mr. Keefe for publishing such an educational book for us - sharing all the informative information and what is going on in reality within society. “Tick Tock” depicts time, energy and money wasted on trying to solve a problem that is virtually unsolvable. There is not enough money in the world to remove all the Asbestos and lead-based paint from every building. The author has an interesting way to introduce a discussion on the control or management of hazardous materials such as Asbestos and lead-based paint. The opening chapter begins with the stage set in an intense atmosphere only to level with a gathering of minds to discuss all the options concerning the prevention of spreading contaminants in our environment. The book emphasizes the need to step back and look at the safest method to avoid full removal of hazardous materials which can create problems such as, transportation, disposal, storage and replacement of building materials. Better to safely manage these hazardous materials in-place than exacerbate an already liable problem. It was a good read and I reread several sections if you can believe it. It is a great reference for any novice or professional who is looking for quick and concise comparative information. I teach EPA lead-based paint classes and as a Historic Preservation contractor for 20 years believe encasement is more economical and logical when it comes to preserving historical structures. Many studies have shown that preservation is more cost-effective in saving energy and the environment than new construction. There is a great truth in the philosophy of economist Donovan Rypkema, who specializes in the economic revitalization of city centers and the development of historic preservation, “The Greenest Building is the One still Standing”. I will suggest it to all my classes. I loved your book when I read it last year. I found it informative, insightful and best of all very, very humorous. "Your book is a great, informative read. My inner social worker gravitated to the staggering text not including pages 53 through 61. Clearly one solution to this archaic social problem is your company's product(s)." As a Federal Government contractor who has been in the architectural coatings business for over 25 years I thought I had seen and known it all. “Just Encase They Think You’re Stupid” is an extremely entertaining and tremendously insightful read. I learned more in the time it took me to read this book about lead and asbestos abatement vs. encapsulation than I have learned in the past 10 years. Great job and thanks for the laughs along the way. Wayne Griner - President, John Wayne Construction, Inc.	John Wayne Construction, Inc. I don’t think many people understand the dangers of many of the substance we deal with in our daily life. Most of us have grown up with these items lying around that we have never questioned it or though about the risk these substance pose to our daily life. This is especially true for lead based paints and asbestos. “Just Encase They Think You’re Stupid” was an eye opener, it gave me a new perspective into what the dangers are that is around us, that many a times goes unnoticed or we take for granted. It also gave me a better perspective of how these can be contained or abated to ensure the safety of our community and family. George outlined the dangers and also benefits of abatement so simply in this book that it is a must read for anyone who want to understand what they are up against and what the best way is to ensure a safe environment for our future generation. Excellent book – most interesting and a pleasure to read. Some useful general concepts on how to approach an issue – and we have a few.